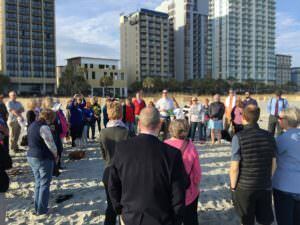 Every other year the ELCA holds a Gathering of the Assistants to the Bishops and Bishops’ Associates. 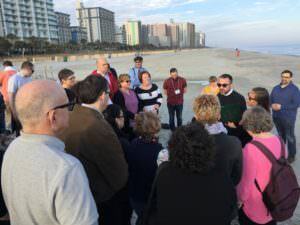 It’s a time for fellowship and learning, as well as refreshment and connecting. The last time we met, I had been in this position for five months. Now I am no longer one of the newbies. 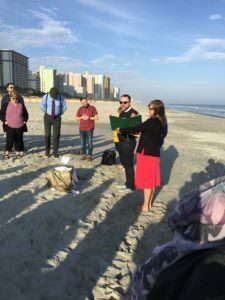 It was a journey to get here to Myrtle Beach but I made it in plenty of time for our opening worship on the beach. We heard an excellent sermon from Pr. Kevin Strickland, who serves as an Assistant to our Presiding Bishop Elizabeth Eaton. He reminded us that we are “enough” as God’s called children, even when we beat ourselves up or think we are not good enough. Sometimes we need that reminder. 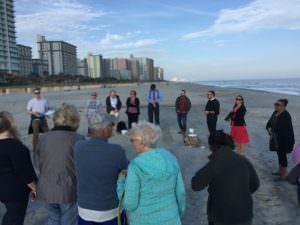 We shared the gift of Holy Communion on the beach, and had a service of blessing and commitment for all those who are new to this group since we last met two years ago. Following worship we gathered for dinner, introductions and opening remarks from our keynote speaker, Pr. Wayne Muller. His focus is on Sabbath and the need to sometimes exhale. As we lined up in order of our years of service, I was much closer to the middle of the group than I was to the beginning. Just a reminder too that there is not a lot of longevity in this call. Much more reason to make sure we take time to breathe. So yes, while it was a journey to get here, it is worth the trip. It sure is nice to see familiar faces this time, and to get reconnected to friends and colleagues. But now for a night of rest before we begin the business of learning tomorrow.